Contact Carr & Carr Attorneys if you have been injured in a semi-truck accident. Semi-truck accidents in Oklahoma caused 1,441 injuries or deaths in 2011, according to the Oklahoma Highway Safety Office. If you have been involved in a big rig wreck, you need to talk with an Oklahoma truck accident attorney. There were 4,731 semi-truck wrecks in 2011, accounting for 6.9% of all reported vehicle wrecks in the state. The statistics are unsettling, especially if you have been a victim who was injured in one of these crashes. Of these nearly 1,500 people who were involved in a wreck with a semi-trailer, 76 were killed, 218 suffered incapacitating injuries such as traumatic brain injury or limb amputation, and 1,147 were injured in other ways. 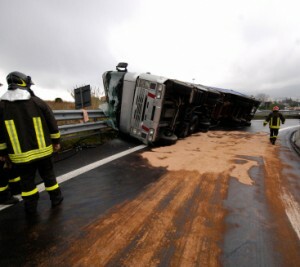 Many of these accidents involved commercial truck drivers. The simple fact is that a wreck involving a large, heavy truck is likely to result in significant injury to people driving or riding in smaller, lighter weight vehicles. The combination of the pounding force of a semi plus a rate of speed that is usually 60, 70 or more miles per hour creates a very dangerous situation. Commercial truck operators can easily suffer from driving fatigue brought on by being on the road for long, consecutive hours traveling across many states. Being behind the wheel of an 18-wheeler for many hours can increase the risk of unsafe driving, including falling asleep at the wheel. The Federal Motor Carrier Safety Administration requires drivers to follow extensive safety regulations, including limits on how long a commercial truck driver can be on the road and when they must take rest breaks. But unfortunately irresponsible trucking companies sometimes violate these safety rules. This puts other drivers and their passengers at grave risk. If you have been injured by an unsafe trucker, you should contact the trucking accident attorneys at Carr & Carr. A lawyer who has experience working with truck wreck victims will be in the best position to protect your rights and help you and your family decide what to do next. Based on the circumstances of your accident, you may be able to recover financial compensation for your current and future medical bills, lost wages, vehicle repairs, pain and suffering and other damages. There is no cost to you for our initial phone conversation. Additionally, since we work on a contingency fee basis, you pay for our services only if we settle or win your case.